Visual Edge Signs & Design did the truck wrap for our BBQ Food Truck. And it turned out AMAZING! No detail was left untouched and we have received so many compliments on the wrap since we had it done! We even got a catering order as soon as we pulled it out of their garage. No lie! Thomas and Tim were so great to work with throughout the entire process, always quick to respond, and offer solutions to any questions that we had. Thomas did an amazing job taking my random little idea of what I was visualizing graphically for the truck and making it come to life. And making sure that everything would reproduce at a high quality when blown up to the size it needed to be, to be displayed on the side of a large food truck. I shopped around a lot before I decided on Visual Edge, and I am so glad that this is the place I picked to do our wrap. They are a great group of guys, very detailed and easy to work with. They even went to the trouble to send us proofs and pics along the way as they wrapped it. Thank you so much for making our food truck look so amazing and making it such an easy and hassle-free experience!!! Everyone is really impressed with the decal and when they first look at it they think it is actually etched in the glass! It is amazing how adding this decal has made the office AND the officers feel more professional. You and your company did a fantastic job. I can't believe how quickly this project was finished and delivered to us. We might have another job in the near future and I will definitely recommend your company to businesses around town. Thanks again for everything! You guys rock! If you have not tried The Visual Edge for your branding needs, you are not being seen. The precision craftsmanship on signs and vehicle advertising is certainly a cut above the rest. The creativity of the team at The Visual Edge is unmatched in its industry. It's only been a week and the new signage on our company truck as well as our new yard signs have already generated new business for us! Thank you Visual Edge and may you help other businesses as you have helped us! Without question if you or your company need signage for cars, office buildings, homes, trade shows look no further than The Visual Edge Signs & Design, Inc. They will create a quality product that is backed by professional craftsman and delivered with integrity to exceed the customer expectations. 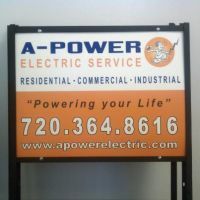 "I contacted Tim at the Visual Edge about some yard signs I wanted to have made for my electrical business. Tim and Thomas were both prompt and energetic to complete my project quickly. While talking about my design Tim had some great ideas on how to make my sign stand out with colors and phrasing. I want to thank Tim and Thomas again for all their hard work. My signs turned out amazing!"